Preston had his second swim lesson today. We skipped last weeks Thursday class because Preston woke up early that morning, threw up, and promptly went back to sleep after a bath to clean him up. I wasn't sure what was wrong with him so we hung around the house all day. He didn't act like anything was wrong when he woke up in the morning so I'm guessing that the chips and dip Brad gave him the night before, that prevented him from eating any of his dinner, upset his tummy. Back to swim lessons. If you can really even call it swim lessons. That implies that he got in the water for more than two seconds. First he wouldn't get in the pool because he didn't believe he could touch. He could have if he would have just straightened his legs out and calmed down. Then when the pool we were in got contaminated (Ewww) (Double ewww, it was one of the geriatric water aerobics participants that did it! ), we had to switch over to the cold pool and he refused to get in because it was cold. Which means that Preston spent the rest of the lesson sitting next to me on the bench. We go back again on Thursday for another lesson. 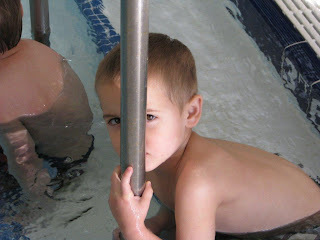 Preston promises that he's going to get in the pool this time as long as it's the warm pool. You know the one he doesn't believe he can touch in. I'm dreading it. I hate that I paid for these lessons and he's refusing to even participate. And I'm running out of ideas to get him to actually get in the water and play. I know he's not really scared of the water because by the end of summer he was hanging out in our pool no problem whether I was in or not. I'm just running out of ideas and I know that if he would start participating he would really enjoy himself. I tried bribing him. I thought about just handing him to his teacher and having her take him for a swim, but I was worried that he would get himself so worked up that it would make the whole thing worse. Any suggestions? To see what this is all about go here. 21. Getting to see Miss Madison again! How cute is she? And seeing that Jen is enjoying all of the outfits that I bought for Madison. Madison wore three of them in the couple of days we were there! 22. Snuggles with my little man! 23. Visiting Brad's Grandparents and watching Preston jump out of the car and run to Grandpa Pitts and give him a big hug. Even though the last time we saw him was in May. 24. Big Wally's and all the food! The burritos, the nachos, the french fries. YUM! 25. Staying up late chatting with Denise. 26. Getting to see my youngest sister-in-law at cheerleading practice! 27. Exploring and playing around Aunt Caelan's farm. 28. Brad finally getting to meet his niece. 29. Visiting Grandma Geneva for the first time since Memorial Day. 30. Deciding at the last minute to stay two nights instead of one. To get caught up go here. Way back when we were in Seattle celebrating Miss Madison, Gigi and Dave took me and Preston to play at the zoo! We love the zoo! I seriously wish we had one this awesome closer to home. We were so excited to get to go with Gigi and Dave! We raced around and explored. Generally just tried to wear Preston out. Luckily Gigi was there to help Preston figure out the map. Preston made some new friends in the bird room. He seriously loves this room. He was so excited and we bought like four seed sticks for him to feed the birds with! There was a meltdown or two... or more. We were trying to see it all and by the end of it Preston was done. Just done. Had he not been my child it would have been hysterical, but not so much when it's my child melting down about every single thing by the time we left. Obviously we had a lot of fun! Thanks Gigi and Dave for taking us! Funny story...while we were there Preston ran into a little house in the farm area. He was refusing to leave the area and kept insisting that I needed to knock first. Finally I knocked. He answered. I told him it was time to go. And then he informed me that I needed to hang on while he grabbed his purse. We're working on that one. 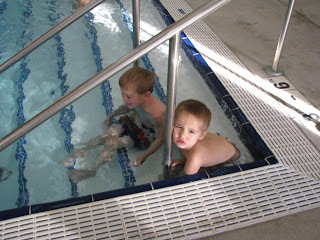 Preston started another round of swim lessons yesterday. I'm so excited this go around because he gets to participate in a class of kids his own age and an instructor, no parents! It makes me feel like he's in the big boy class now and he's actually going to work on learning to swim instead of playing games and singing. Plus it totally means that I don't have to put on a bathing suit and climb in with him! Score! Preston was interested in the first half of the lesson. He swam. He participated. He sat nicely on the stairs. The second half not so much. He pouted. Finally decided the water was too cold. Climbed out and refused to get back in. Mason got to come with us, I had him for the day, and he enjoyed getting to know Preston's friend Zack's little brother! When he wasn't trying to escape to the pool. We go again tomorrow. Here's hoping that this time he'll make it through the whole lesson. Doesn't Mason look oh so cute in pigtails!? It's almost a waste to have that all that hair and not be able to "pretty" it up! Brad was busying this weekend helping a friend out, so Preston and I convinced my sister to hang out with us. Scratch that, Brad was helping a friend so my sister and Mason were LUCKY enough to get to hang out with us. Yep, that is much better. We decided to check out the local farms and find a pumpkin! Brad and I always take Preston up to a certain farm but I wanted to try a couple of the other ones in the area out as well. One even had a petting farm. But we ended up at HH anyways. And I realized that there is a reason we always go there, it's the best one! Preston and Mason both picked out pumpkins. Mason was loving the whole experience. Preston was good at the first farm and TERRIBLE at the second one! I'm telling you this three thing is rough. We're going back with Brad later on this month for more pumpkins! Preston picked a little one and him and Brad already carved it. Only they did it Sunday while I was watching a movie, so I have no pictures! What was that husband of mine thinking? No pictures!